I know it has been awhile since I posted. 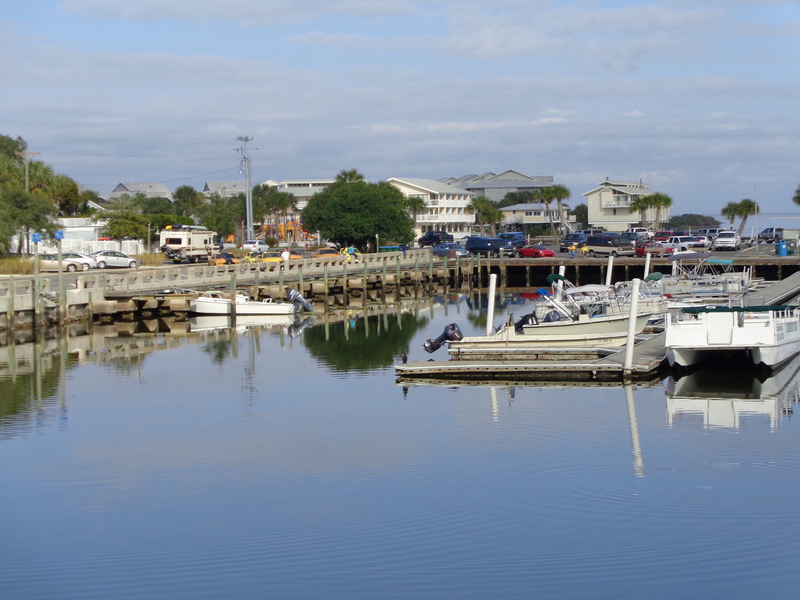 There is just something about this laid back atmosphere in Cedar Key that keeps me away from the computer. 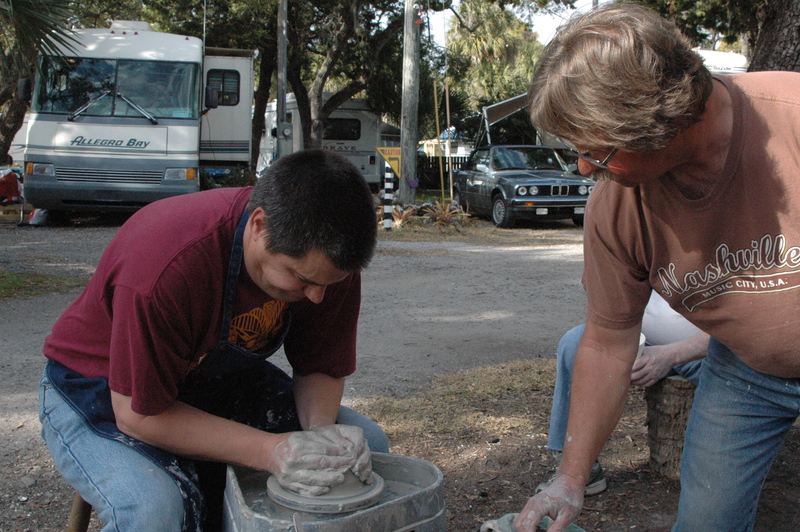 It has been another low-key week here, with parades, pottery lessons and fireside chats. 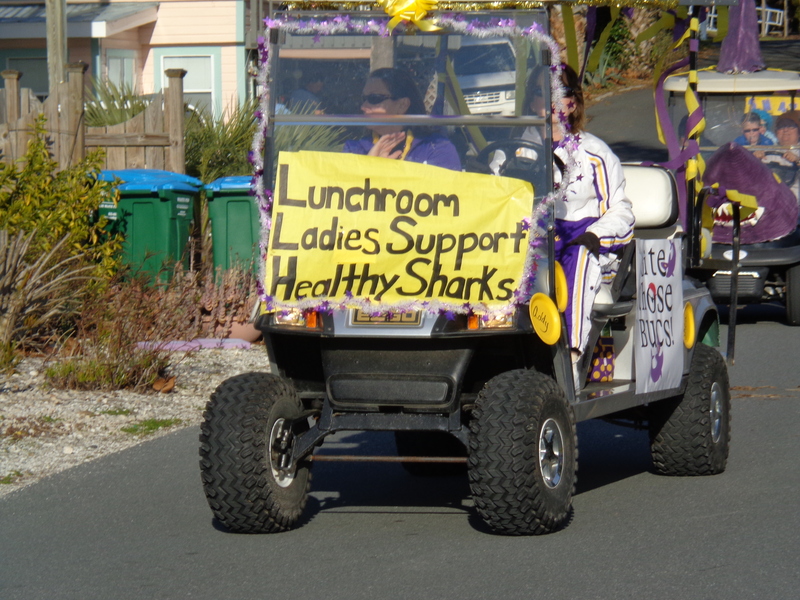 The Cedar Key Sharks had their Homecoming Parade last Thursday. 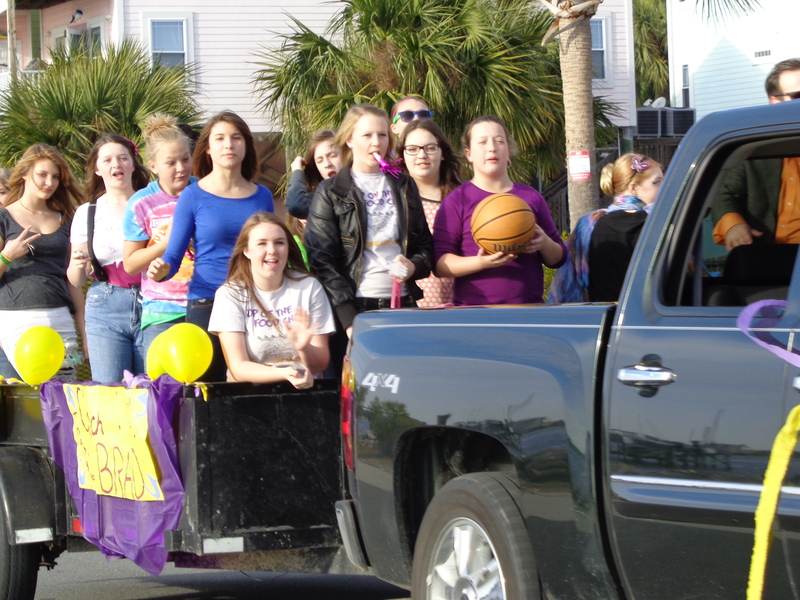 Since they do not have a football team, their homecoming is in January, during basketball season. 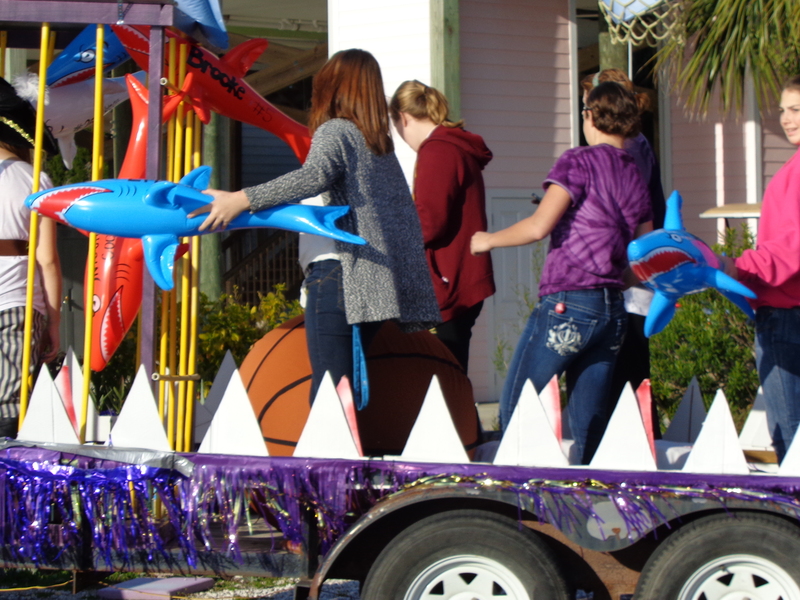 It was a very brief parade, and just when we started walking back towards the campground, the parade had completed the entire downtown loop, and was returning to the school, so we ended up seeing all the “floats” for a second time! 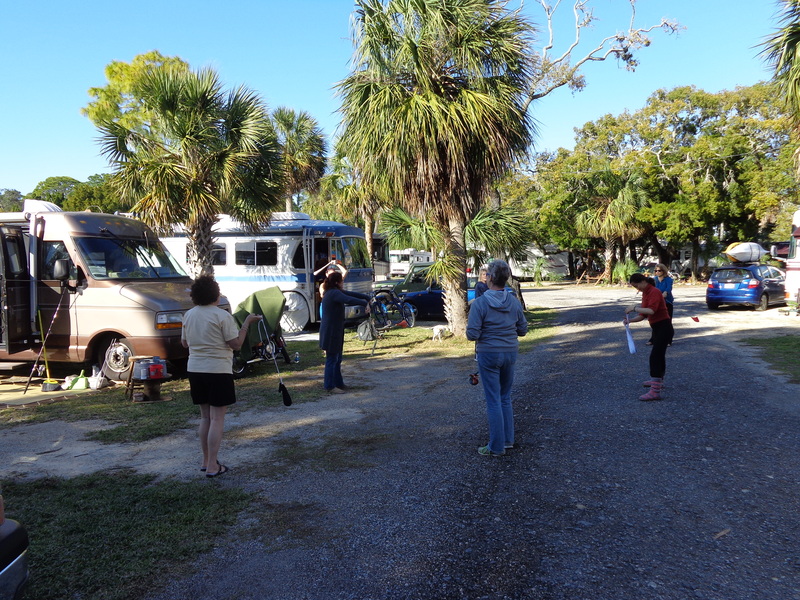 Many of us came to Cedar Key to meet up with Chris and Cherie of Technomadia. We have had several fireside chats this past week on topics such as work camping jobs, and domicile/residency questions. Dan and I are doing the traditional work camping jobs. Others have been able to work remotely with their jobs. There are so many opportunities out there, it is just a matter of spending the time researching what options work best for you. 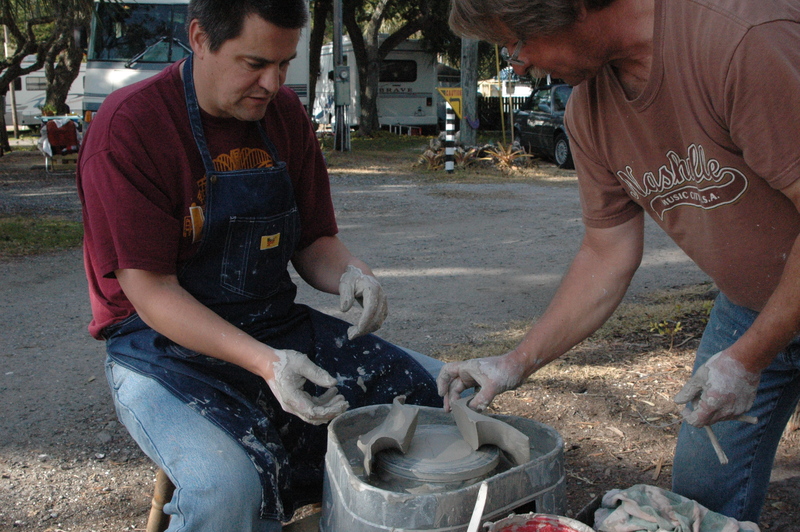 Another person in our park, Dean, who is from Monroe, Wisconsin, set up his small pottery wheel and gave impromptu pottery lessons. 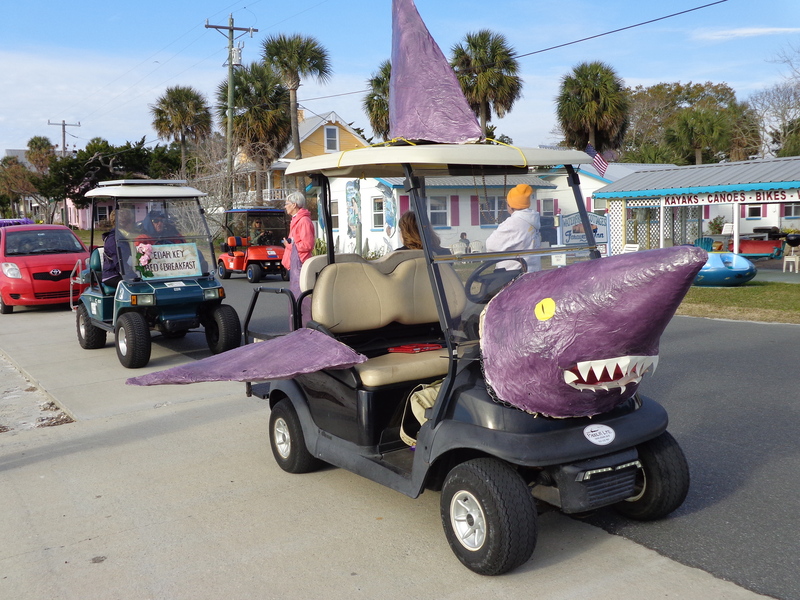 I am always amazed by what people bring on the road with them! 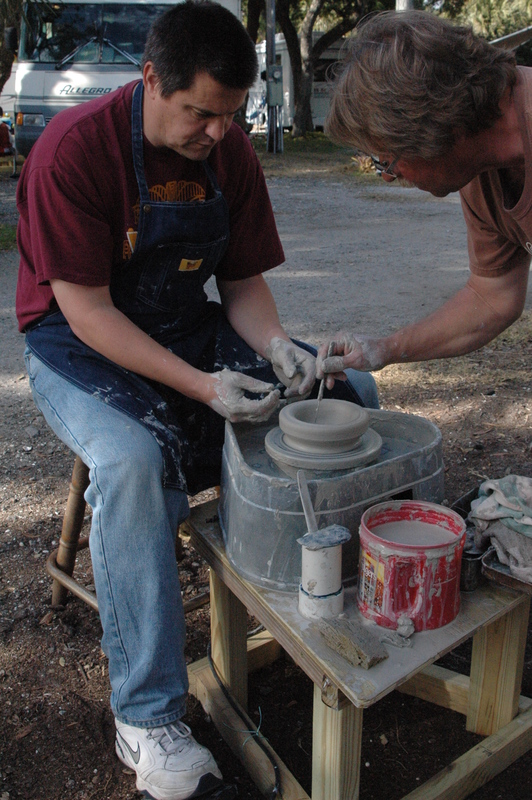 Dan decided to take a brief pottery lesson from Dean. One should never stop trying to learn something new! 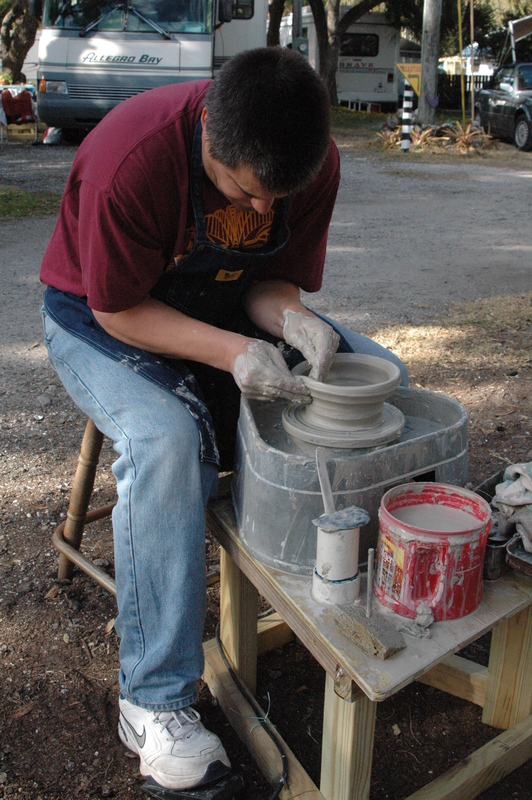 Dean is explaining the proper position, elbows in, and how much force you need to apply on the clay. 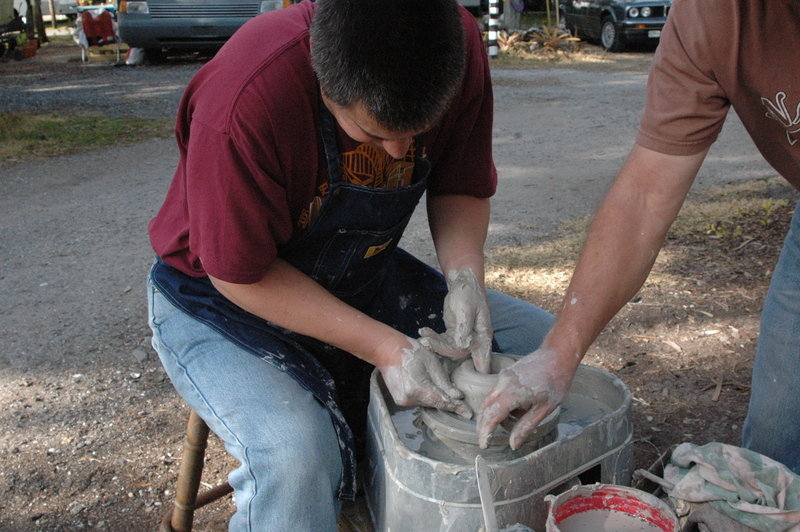 Once you get the feel of the clay, you insert your finger in the middle, and expand the clay upwards. This is very challenging. checking the depth of the clay. After it is finished, Dean slices it in half, to check the depth on the sides. He said Dan did a good job. 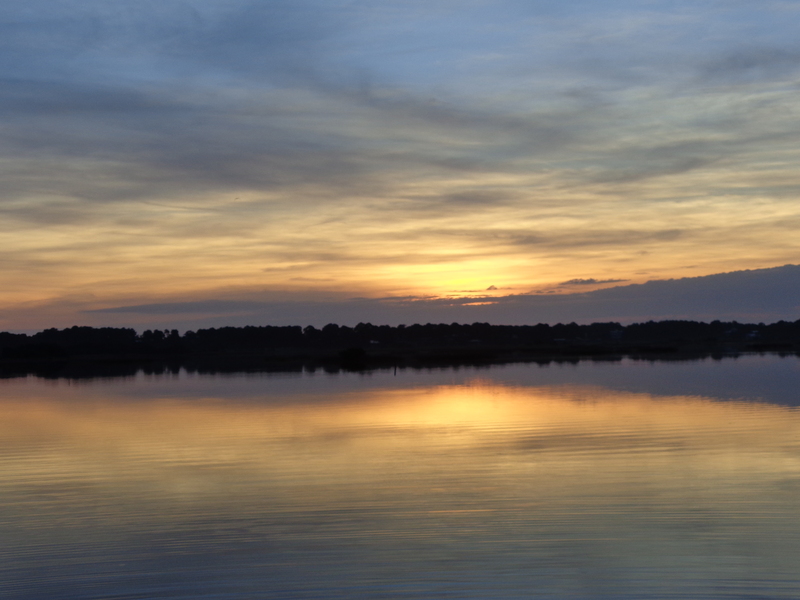 And of course, we took some time for our nightly sunset viewing on the dock. I think this cloud looks like the head of an alligator. My sister sent me a photograph of their indoor/outdoor temperature gauge this morning. 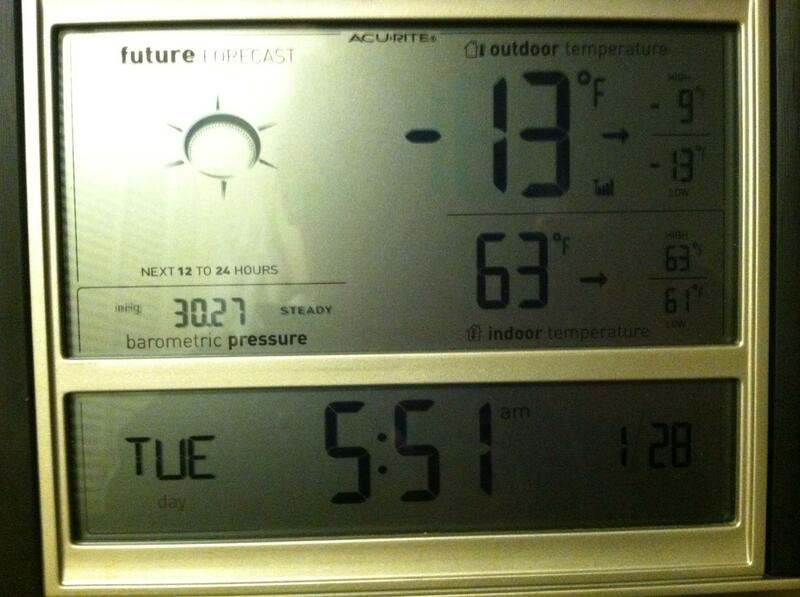 It is showing minus 13 degrees just before 6am today in Wauwatosa, WI. That is some dangerously cold weather, when you factor in the wind chill of 45 below!! We hope everyone back home stays safe and warm!! Just remember, there are only 50 days from today until Spring! Our week started off sitting at the Ford dealership in Gainesville, FL. 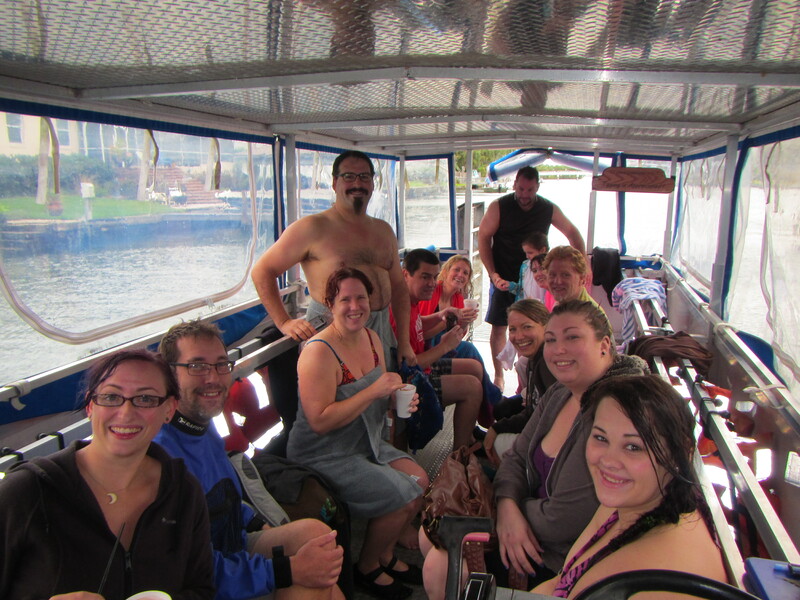 On the way home from our snorkeling trip, the check engine light came on the truck. 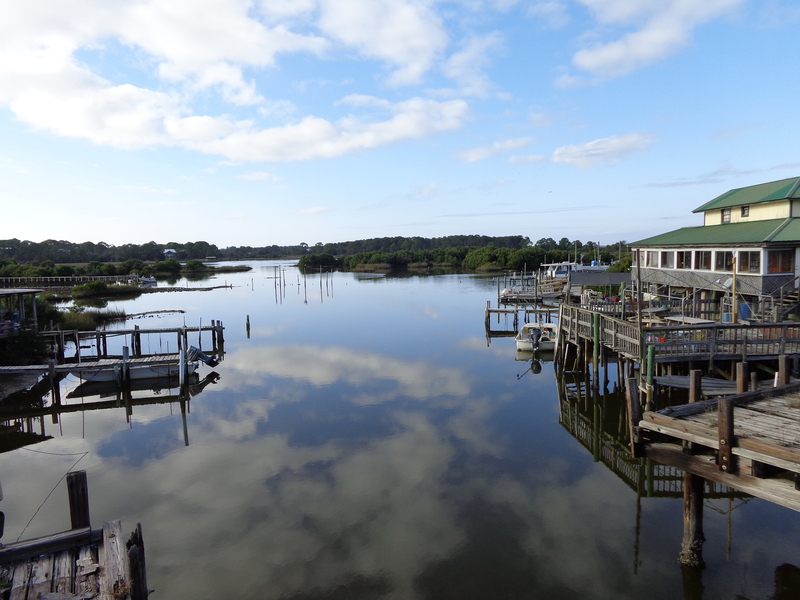 We thought we may have had some bad diesel fuel, as there is only one gas station in Cedar Key, and another person in the campground was having issues attributed to bad diesel. Parks Ford was the only dealership in the area (about 55 miles away) that had a certified diesel technician that could get us in. Fortunately, our problem was caused by a bad DEF (diesel exhaust fluid sensor) that was still covered under warranty. We were there about 5 hours, but it was nice to have a “free” visit. We would recommend this dealership for service. And we did get to see some of the University of Florida campus on our way back. Tuesday we had Poi dance lessons, given by Cherie (www.technomadia.com). Poi dancing originated with the Maori people of New Zealand, and it involves swinging tethered weights in a rhythmic and geometric patterns. 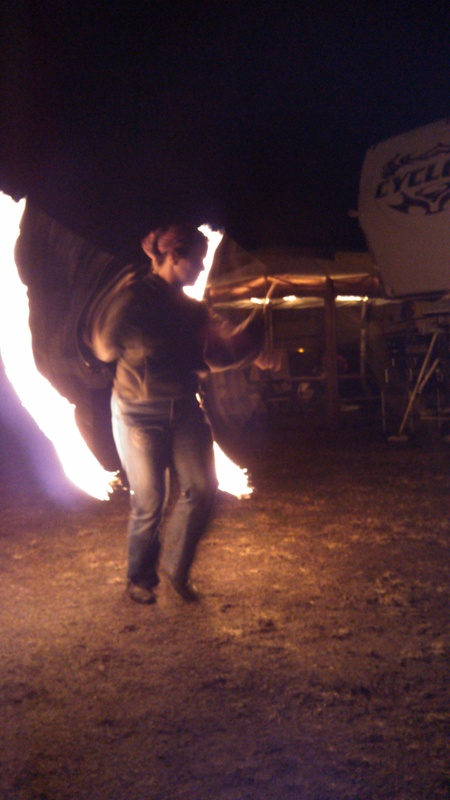 Many advanced dancers, like Cherie, use fire in their dance. She has been doing this for 8 years, and it was fun to see her dance with fire. Given how many times I bounced the bean bags off my head and legs, I don’t think I will ever be playing with fire!! 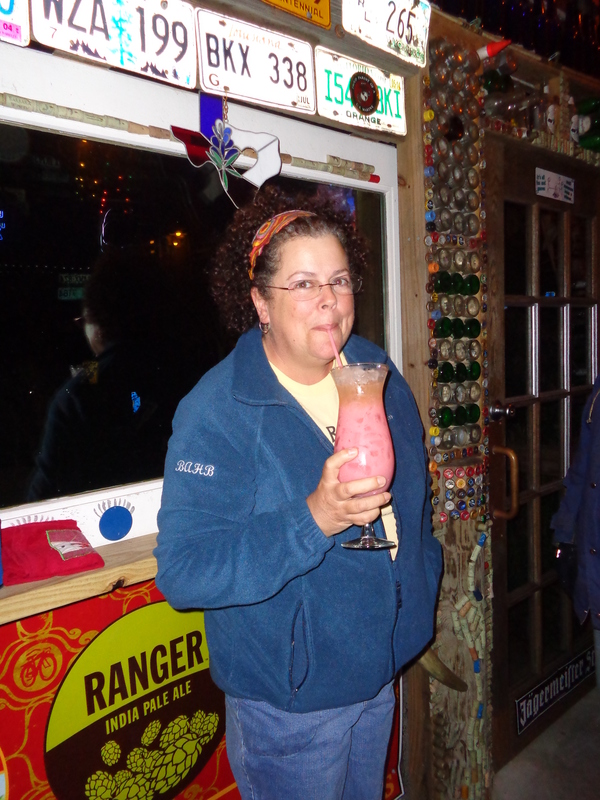 After our dance lessons, we headed next door for another glorious sunset at the Tiki Bar to celebrate Susan’s birthday. 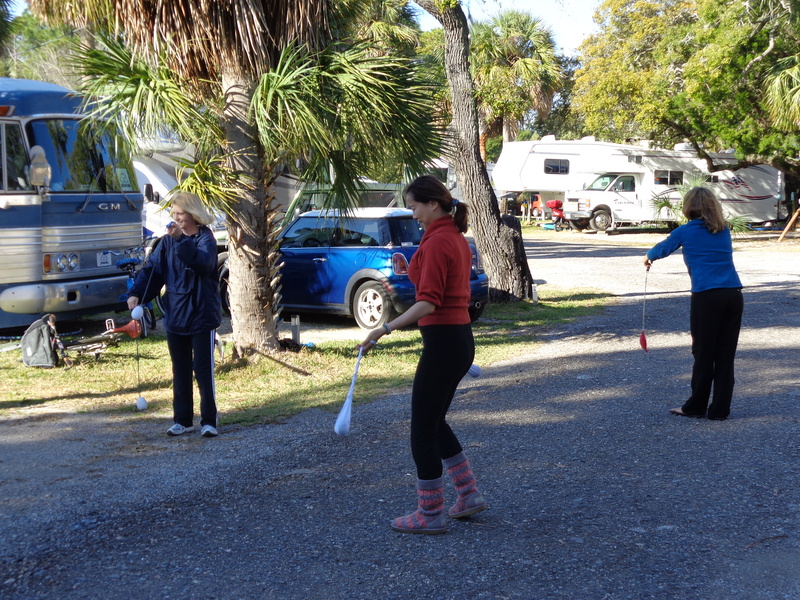 After that, we headed back to the campground, where Cherie performed a Poi dance, with fire. 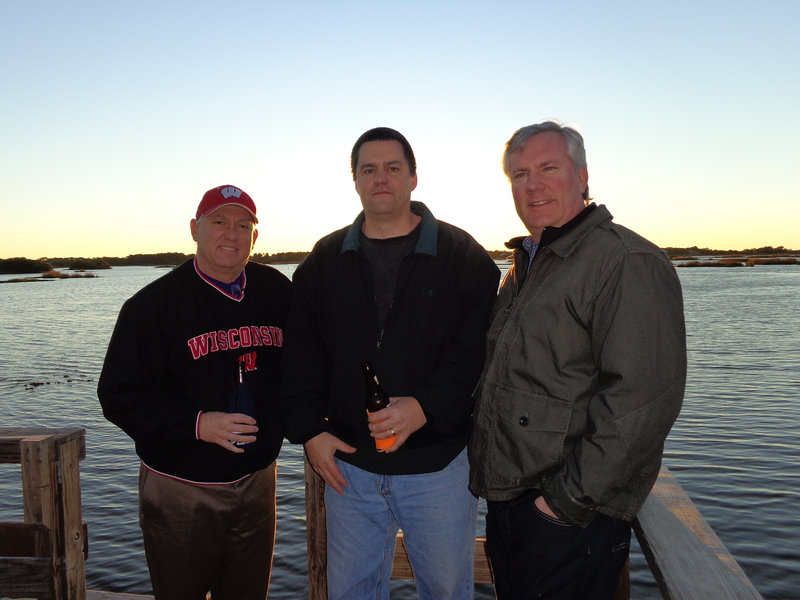 The next day we headed to Tampa, to pick up some friends from Wisconsin that flew in for some “warmer” weather. 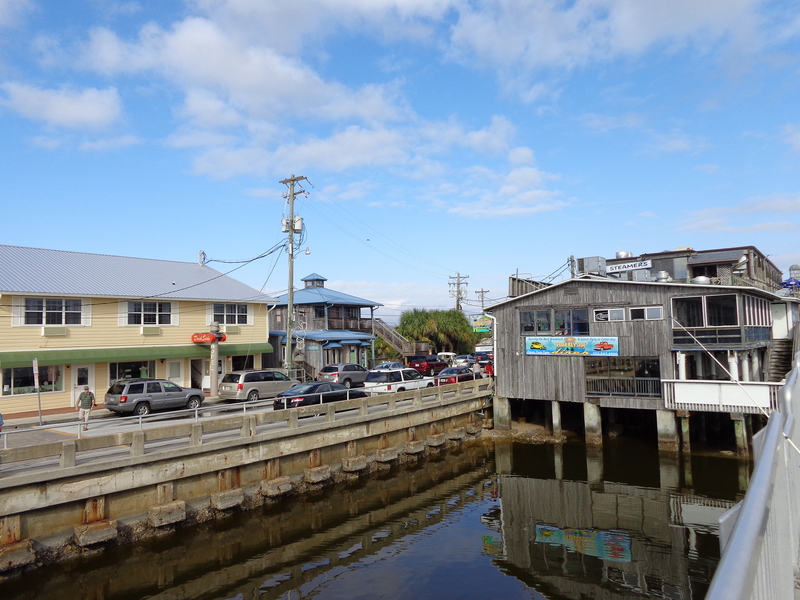 We gave them the quick tour of downtown Cedar Key. 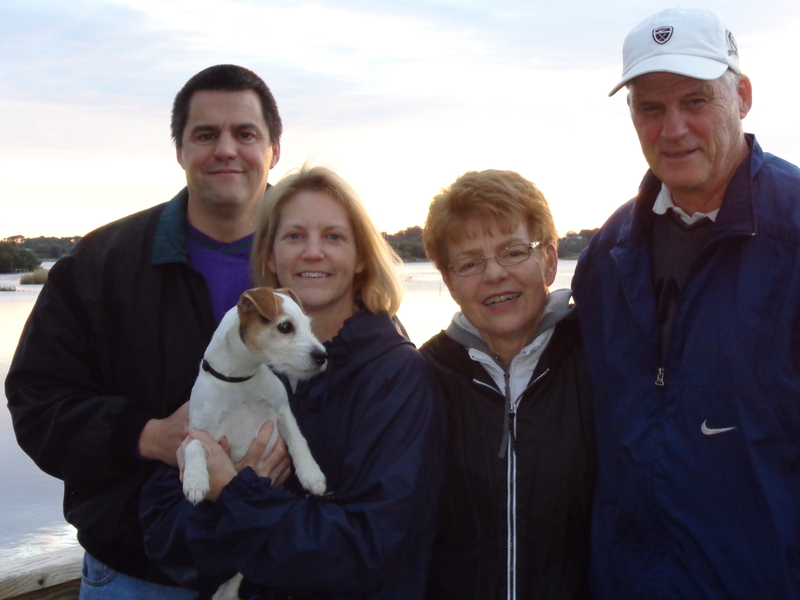 Each day they joined us for our 3 mile roundtrip walk to downtown and back. 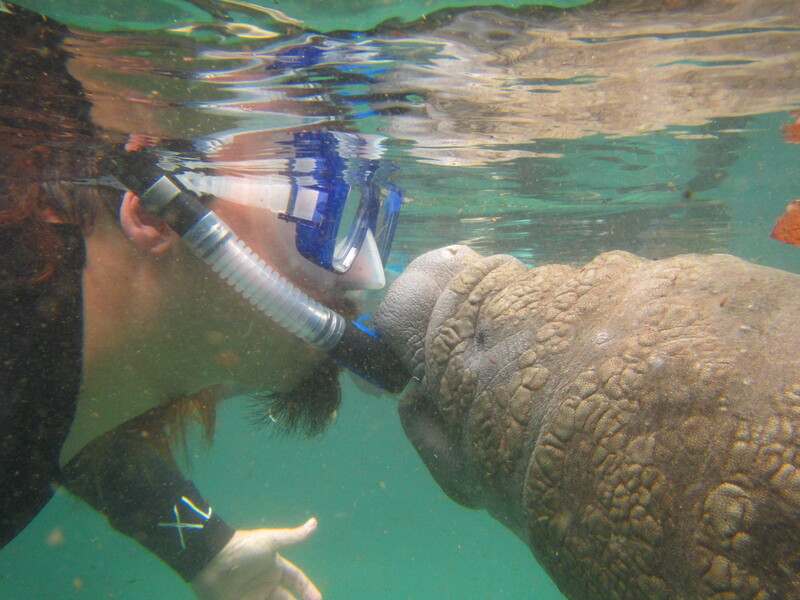 Although they did not get to snorkel with the manatees, Mike did get to have some fun with them. 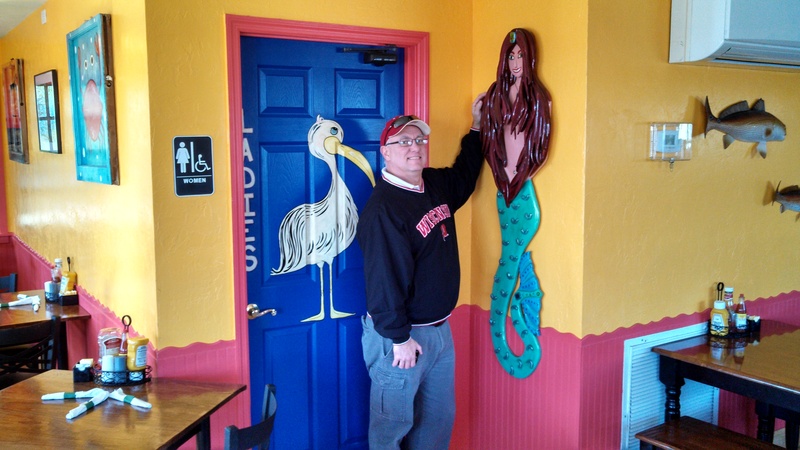 The other Mike was more interested in the mermaids! 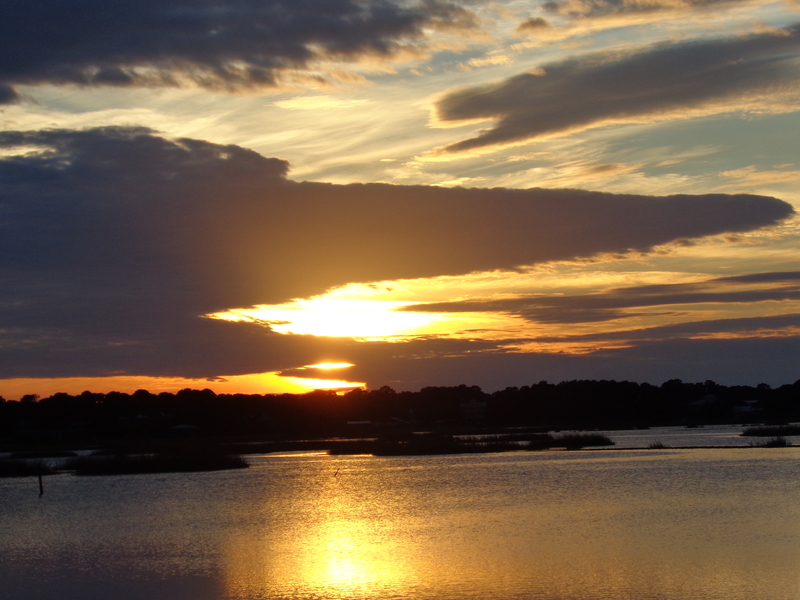 And no trip to Cedar Key is complete without stopping to watch the sunset. We stopped in at Tony’s restaurant, which is famous for their clam chowder. 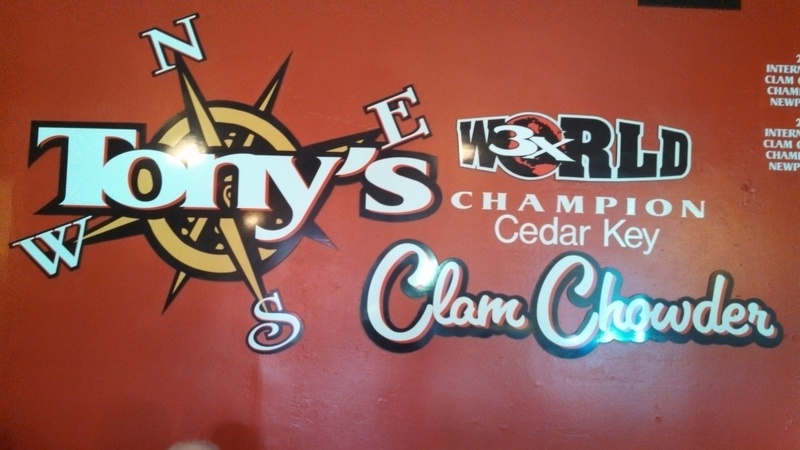 Tony’s is a three-time world champion winner of the clam chowder festival. Once you win three times, the recipe is no longer eligible for entry into the competition. We all thought the chowder was good, but surprisingly spicy. Not sure if they just used too much pepper on the day we visited, or if it was supposed to taste that way. We do plan to try it again before we leave by the end of the month. 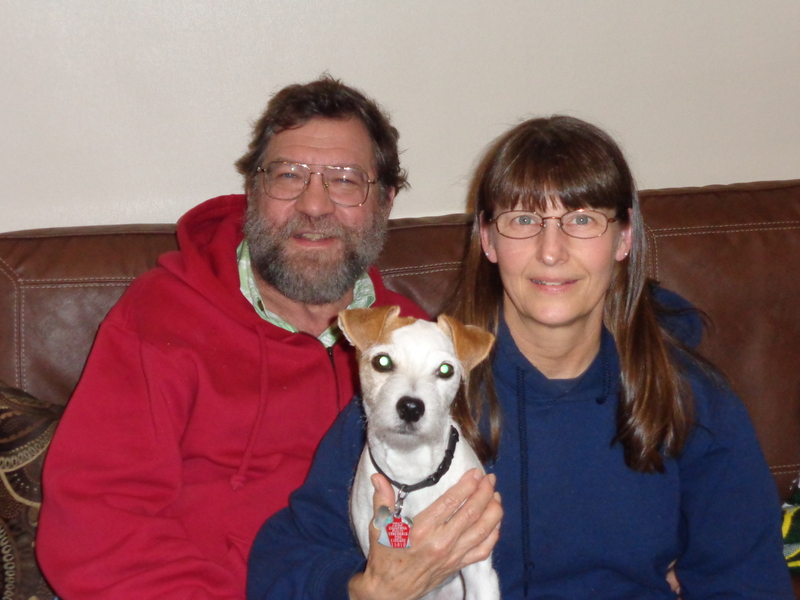 On Sunday, we were able to spend a bit of time with Gail and Jim, whom we met working at Amazon. They are making a slow trek to the Houston, Texas area, for a work camping job starting in March. They walked Makena every day that we worked, and Makena was very excited to see them. 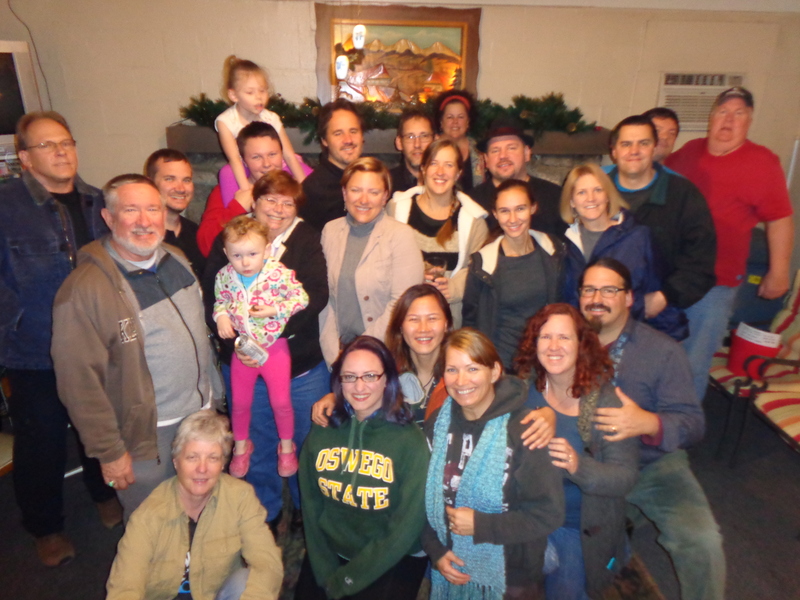 We had a great time getting together with friends, both old and new. Our door is always open if anyone wants to come and visit. 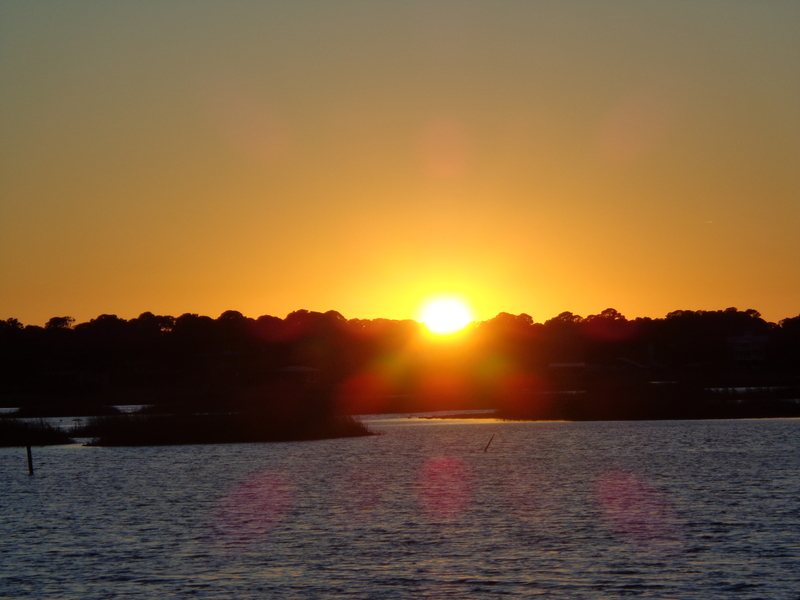 We hope the weather will start warming up even more. 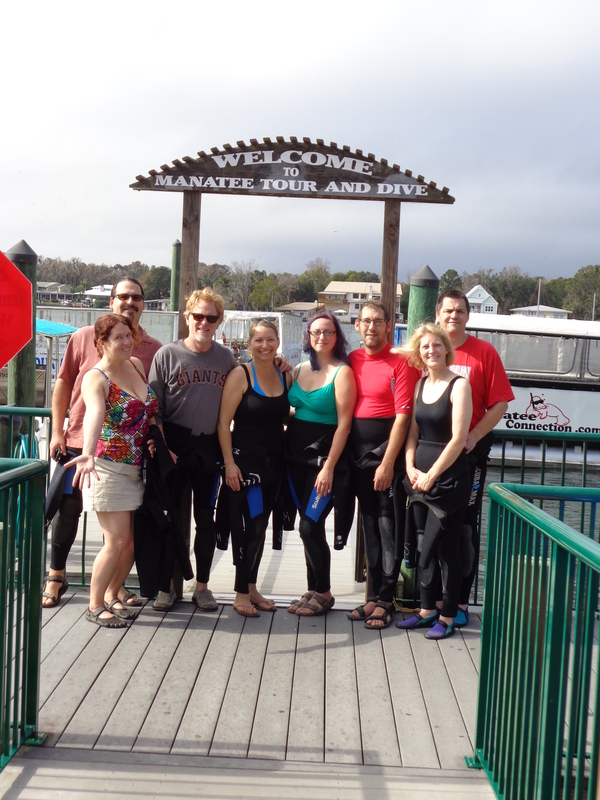 Saturday we went to Crystal River with 3 other couples, to snorkel with the manatees in the Crystal River National Wildlife Refuge. 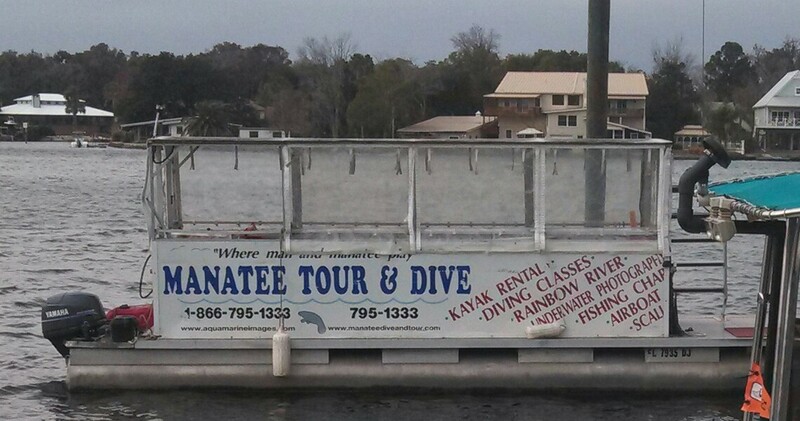 Normally the tour with Manatee Tour and Dive costs $49.00, but one of the couples found a Groupon, so we only paid $20 each. Even at the full cost of $49, it would be well worth the experience. 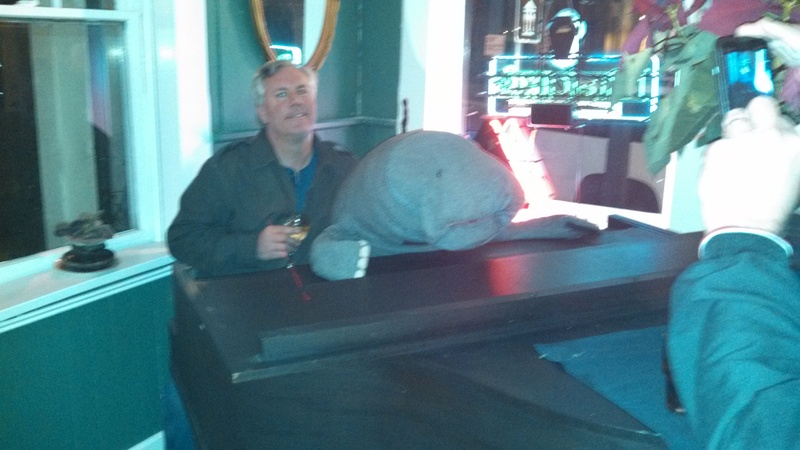 First, a little background about manatees. 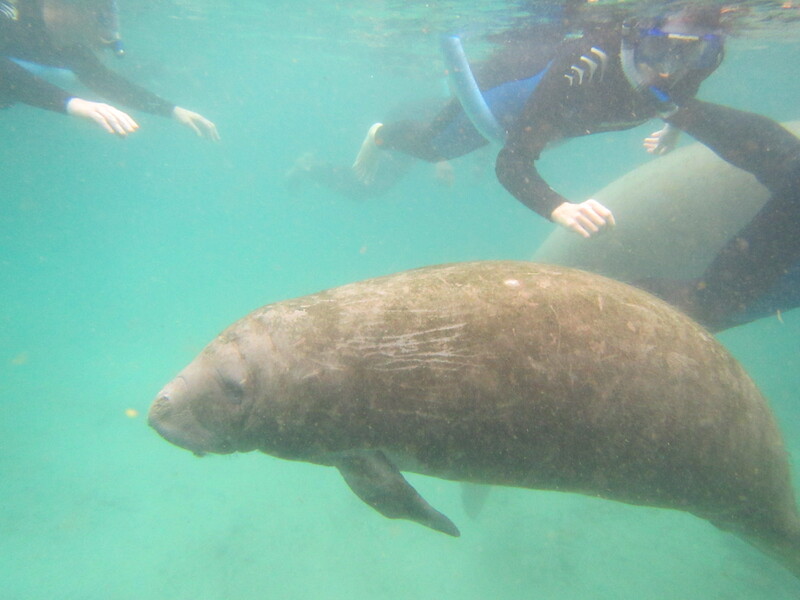 Manatees are herbivorous (plant-eating) marine mammals, sometimes referred to as sea cows. 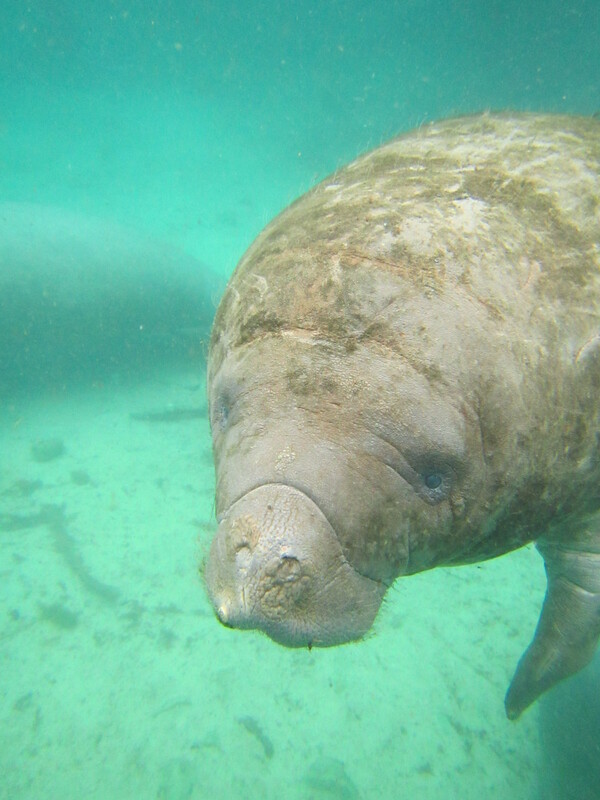 There are three main types of manatees: Amazonian, West Indian, and West African. 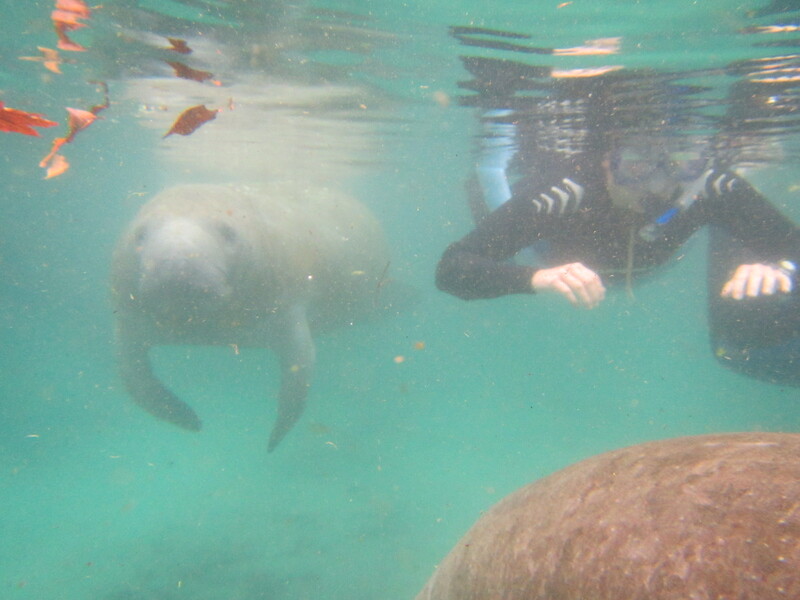 The manatees in Florida are West Indian. 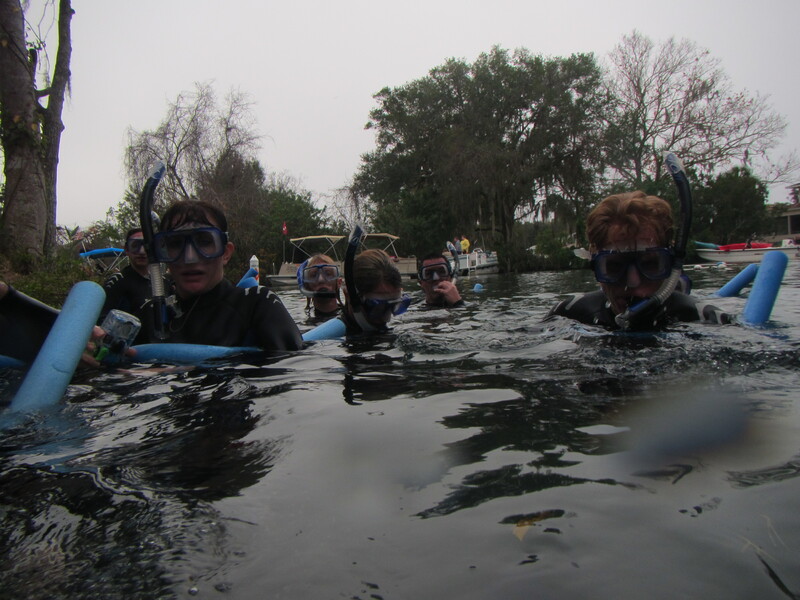 They come to Crystal River because the water temperature in the springs remains 72 degrees year round. 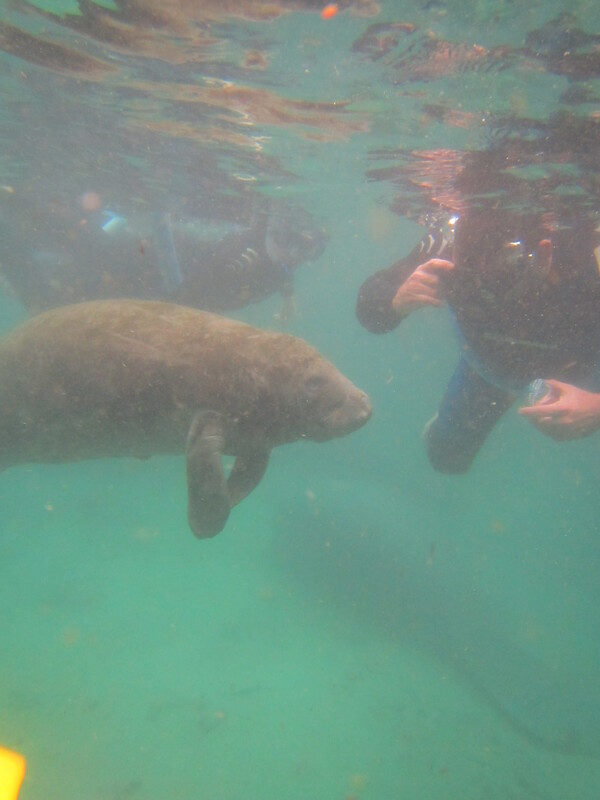 Manatees, despite their size, do not have a lot of body fat, and cannot survive for an extended period of time in water that is less than 68 degrees. 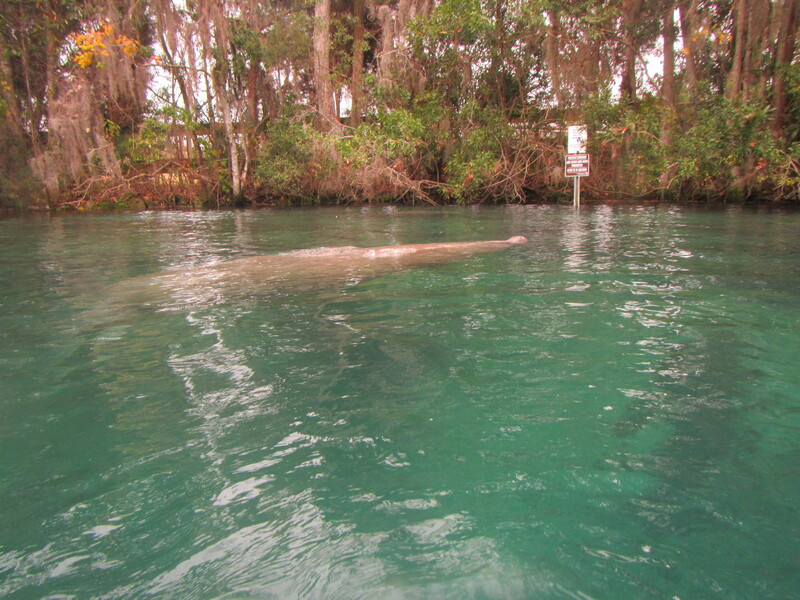 Manatees can live upwards of 60 years, weigh 800 – 1200 pounds, and are 8-10 feet in length. 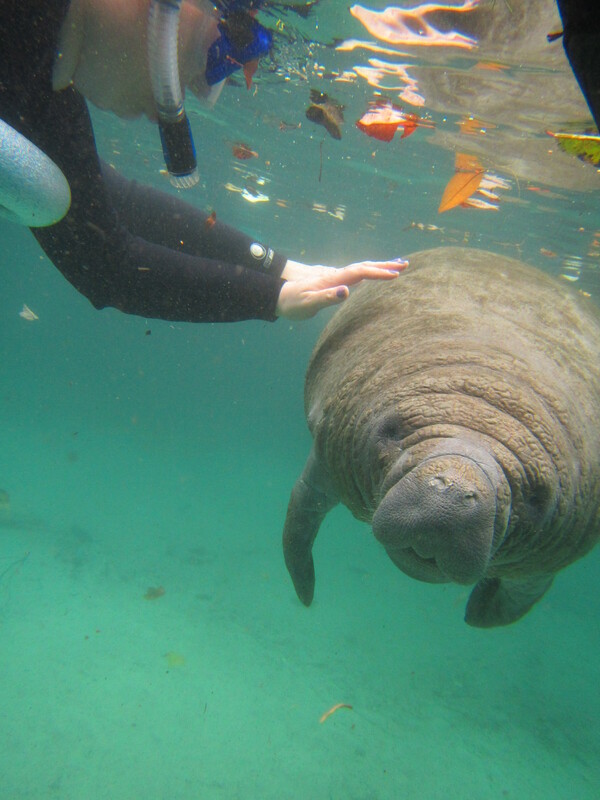 A baby manatee weighs about 66 pounds at birth. 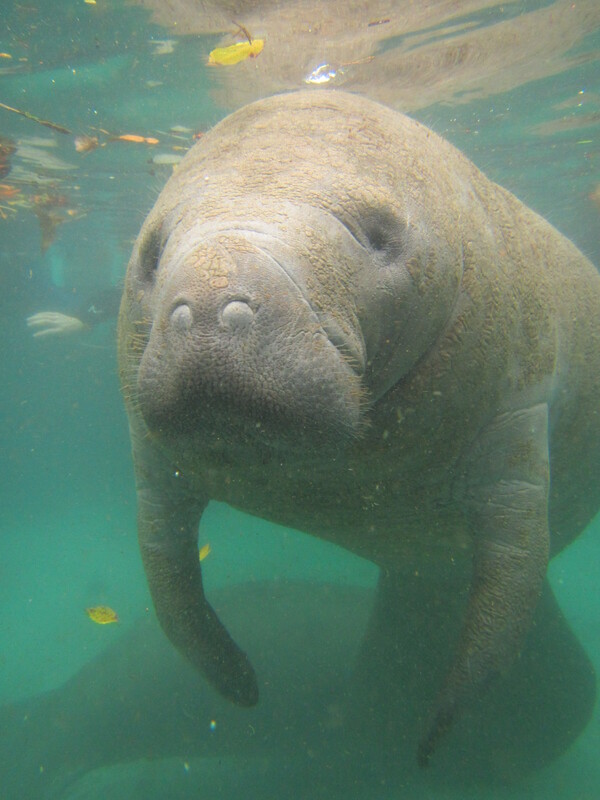 Manatees spend half their day sleeping, and can stay under water for 20 minutes, before floating up to the surface for a quick breath of air, then gently sink back down. They are still an endangered species, and are very gentle animals, when treated with respect. 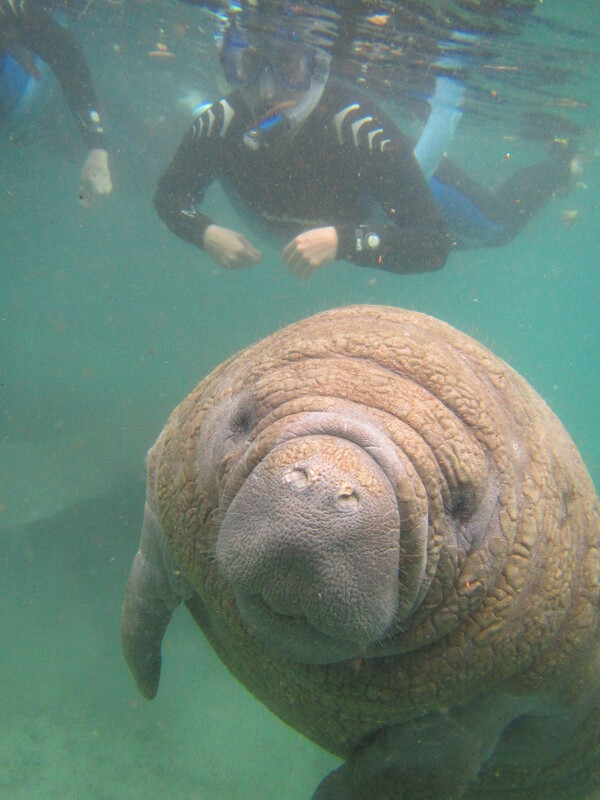 It is against the law to approach a manatee, but you can touch it, if it approaches you first. 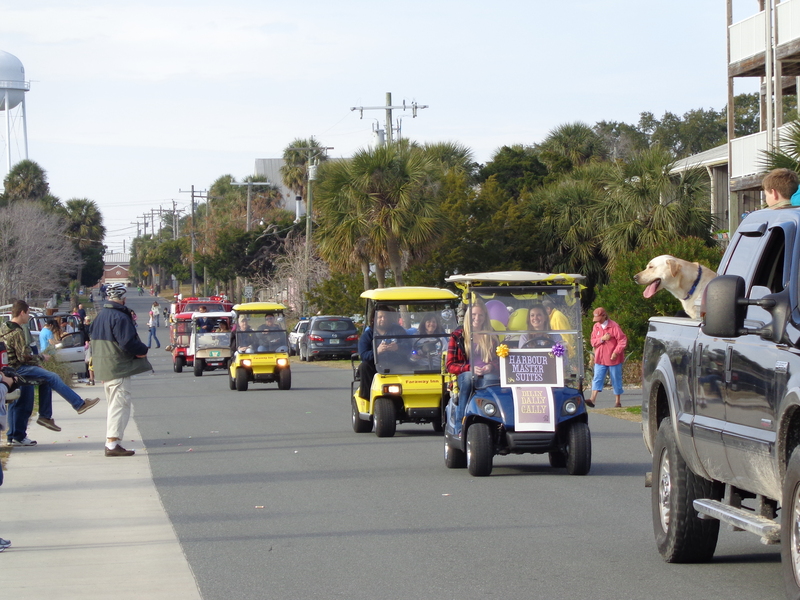 The tour company goes over a long list of the rules of what you can and cannot do during the tour. And there are many volunteers in the wildlife sanctuary that make sure us humans respect the gentle giants. 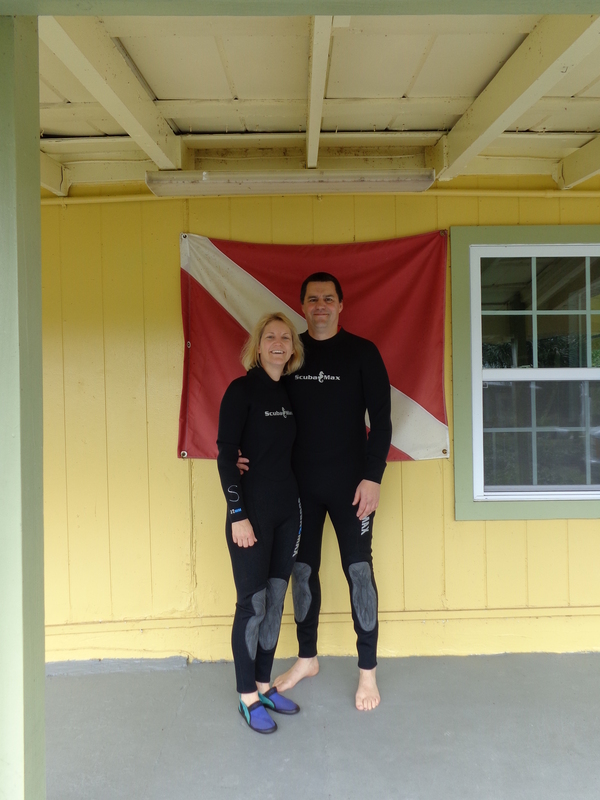 Our tour started out with getting fitted for a wet suit, which neither of us have ever worn before. 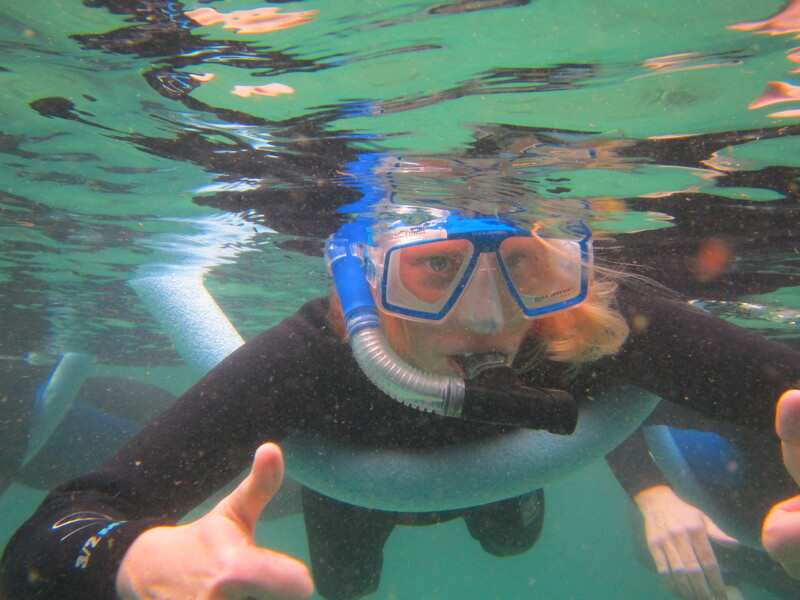 The suit is required, since the water is 72 degrees, and helps to keep you afloat. 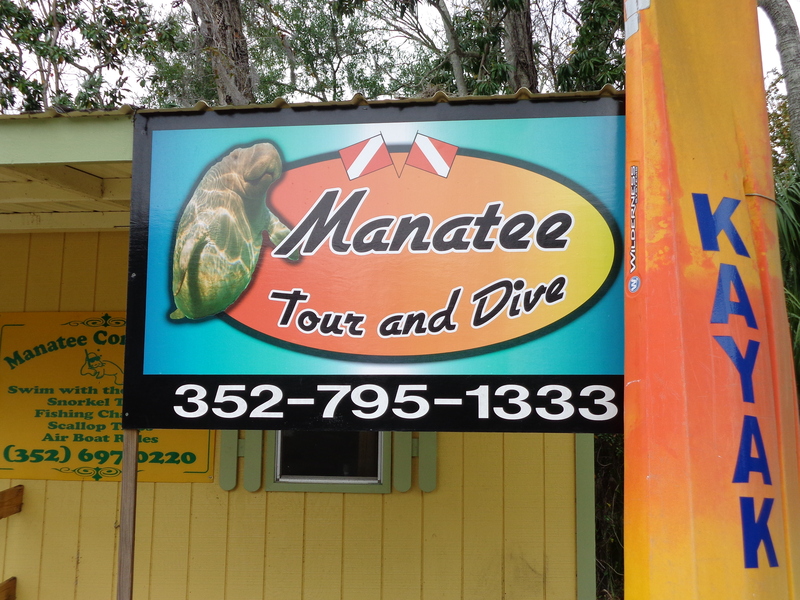 After we squeezed into the suits, they have a brief safety and informational video on the manatees. 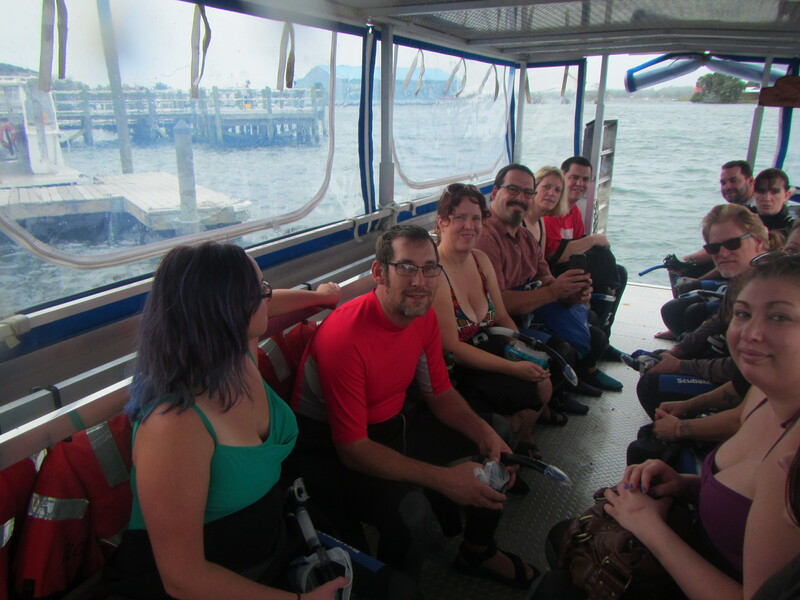 Then it is off to the boat, where we received more instruction from our captain. 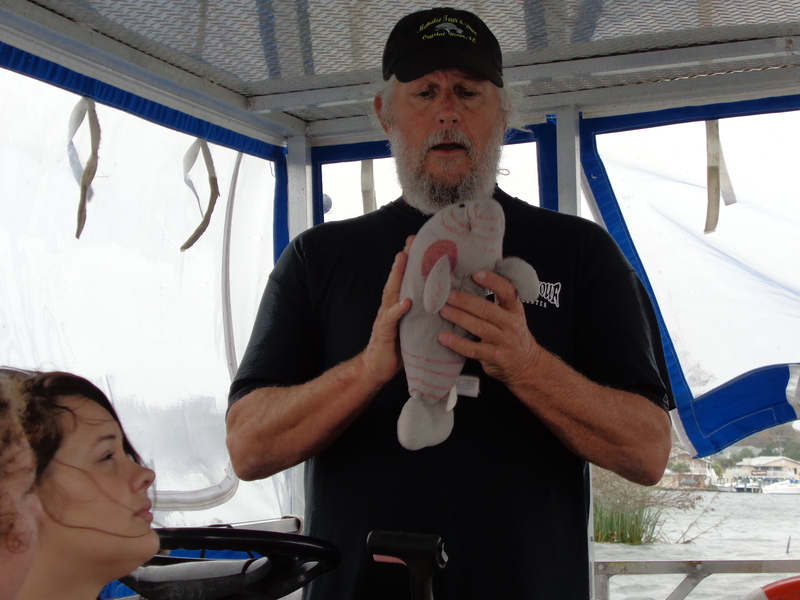 Captain Glen used a stuffed manatee to explain the areas we are allowed to touch if a manatee approaches you. 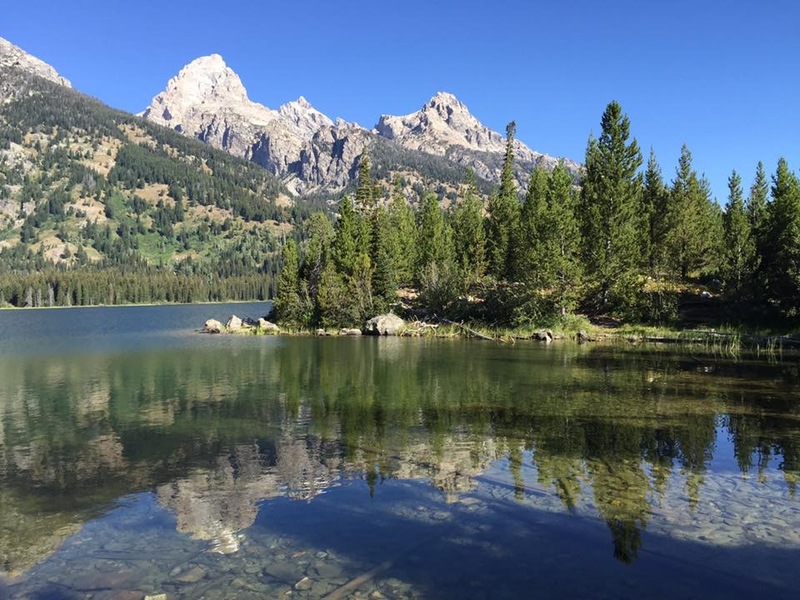 Once we get near the sanctuary, the boat is anchored in the river, and we all get our “flotation noodles”, and slowly get acclimated to the cooler temperatures in the water. The river water is pretty murky, and then we follow Captain Glen into the sanctuary, where the water gets pretty clear. 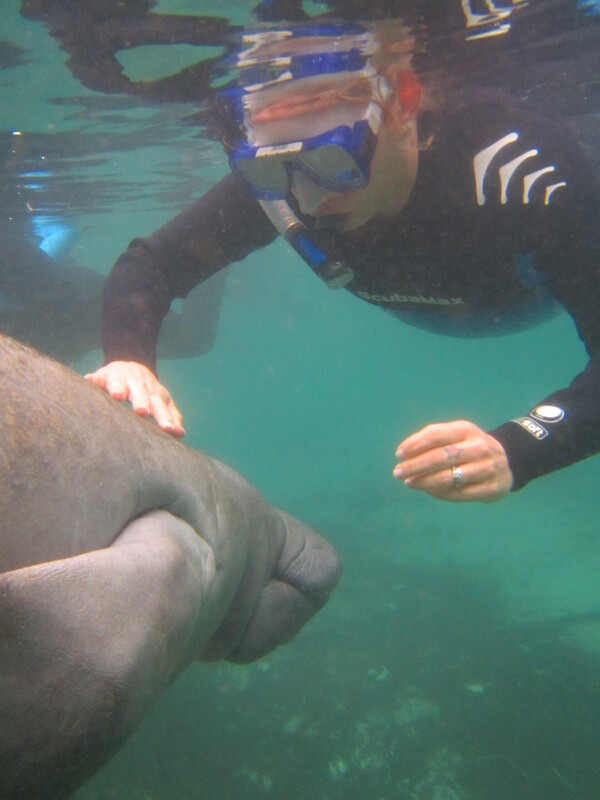 Here is a manatee that popped up for a quick breath of air. 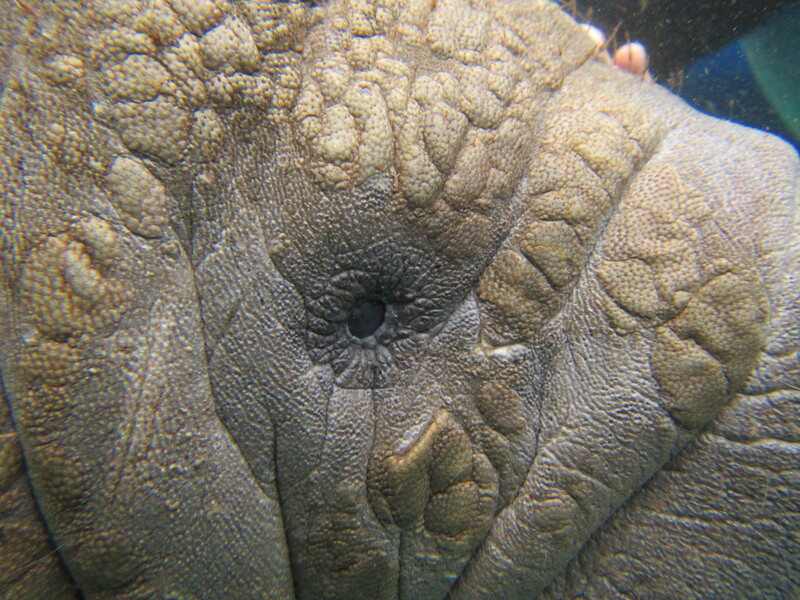 You can see darker shadows under the water where other manatees were hanging out. For me, it was a little frightening when you see this coming at you!! But they truly are gentle mammals. If you remain still in the water, and keep your feet up, they will come right up to you. I do not swim, so Dan would check in on me to make sure I was doing okay! Dan had one swim right under him! 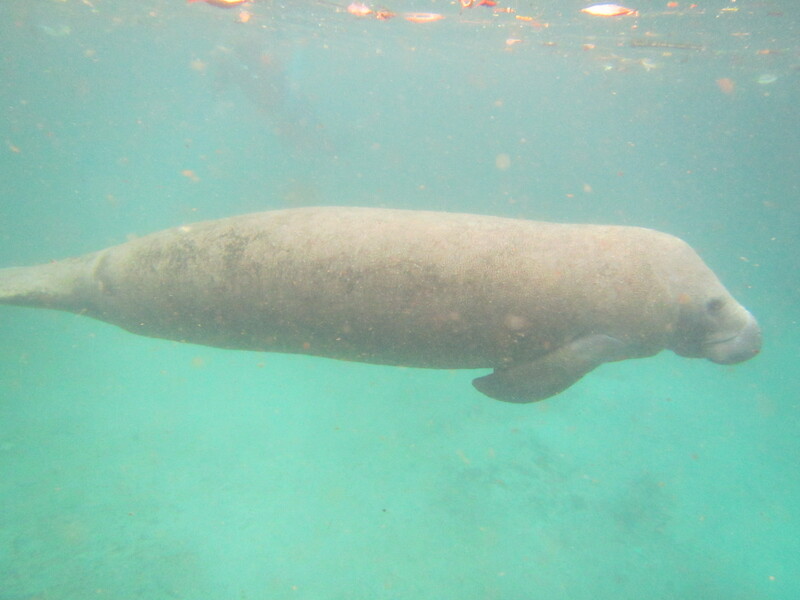 We were in the water about 1 1/2 hours, and saw manatees the entire time. 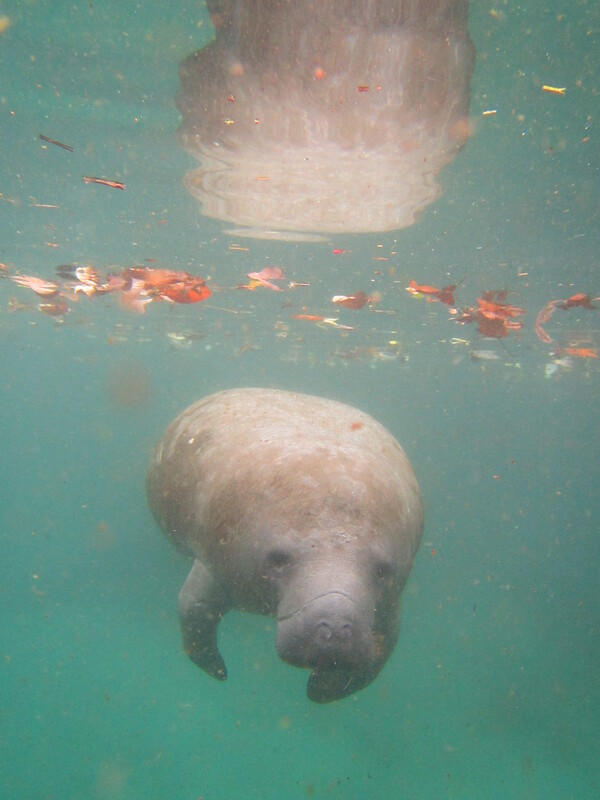 With the cooler weather, the sanctuary had hundreds of them seeking out the warmer water temperature. 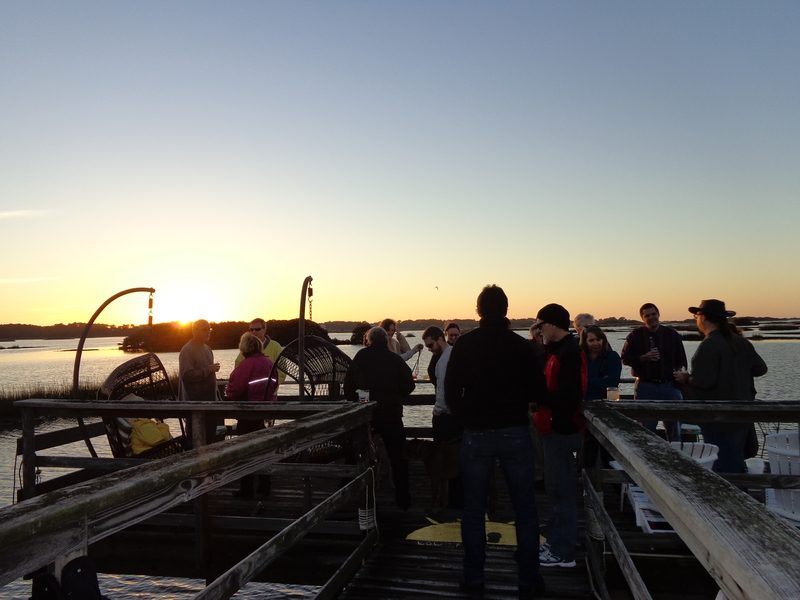 Many of the manatees stay year round, but the best viewing is during the winter months. 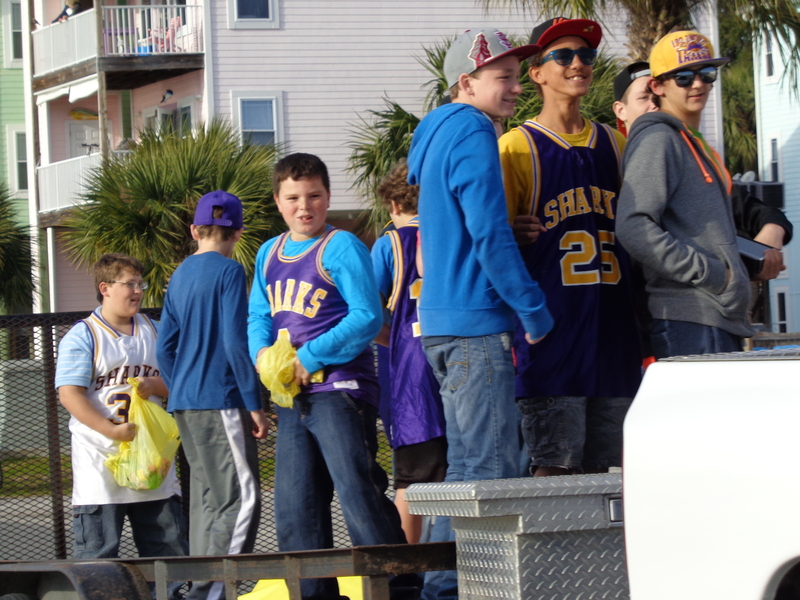 We had a happy group on the return trip. Our captain had hot chocolate for our return trip back. 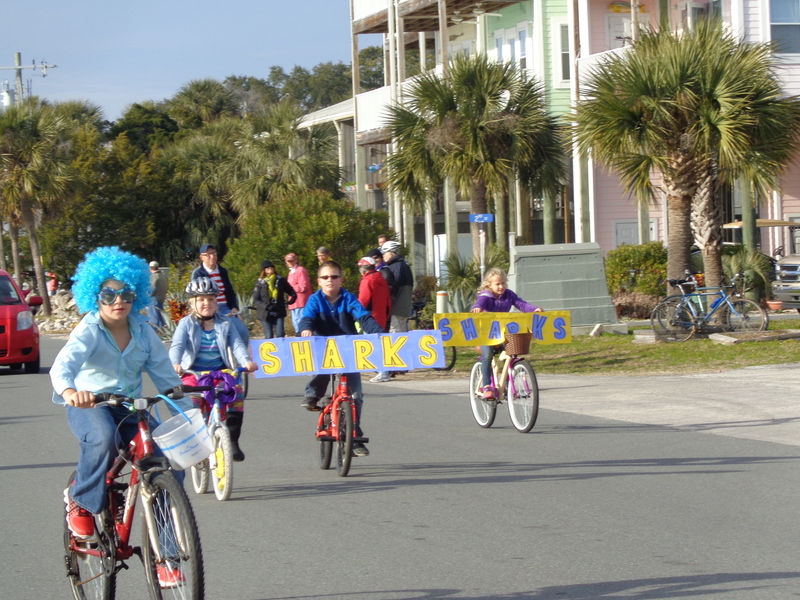 Everyone had a fantastic time, and we would highly recommend this experience if you are in the area. Thursday we met a group of folks from this campground for pizza at the Tiki Bar that is just down the road. 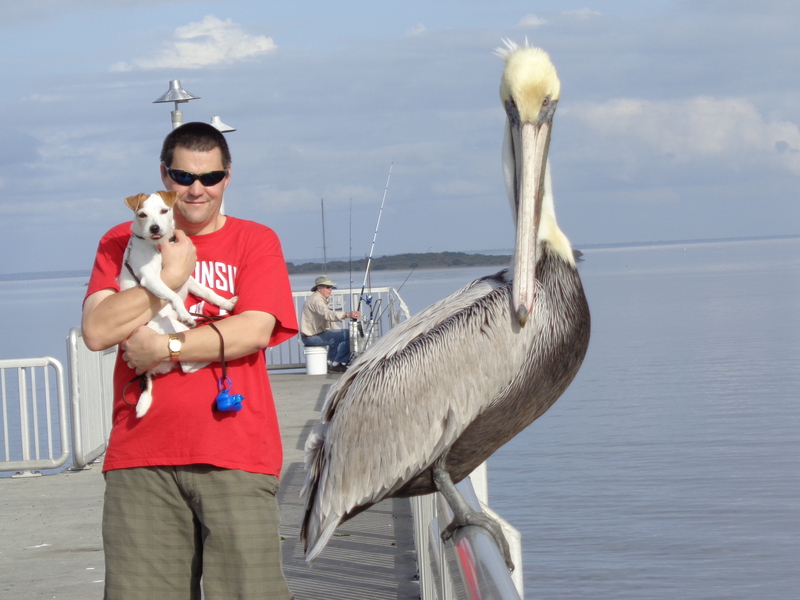 It was started by another Rv’ing couple that came to Cedar Key four years ago, fell in love with the place, and then decided to stay. 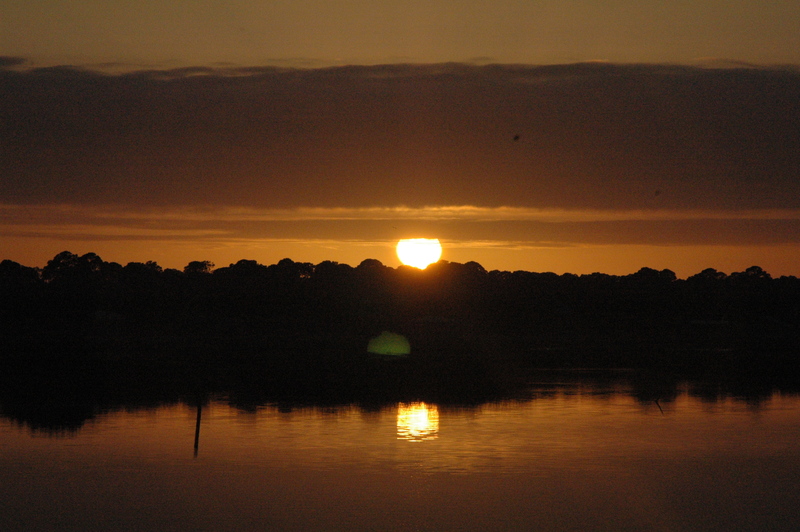 And of course, we took time to watch the sunset again. It just never gets old. 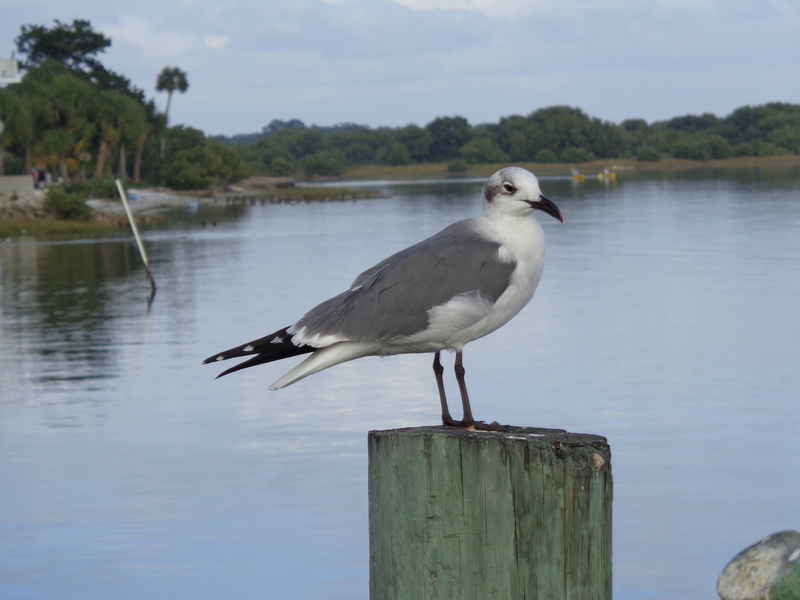 Here’s some photos from our walk. Sunday turned out to be a beautiful sunny day, and we were able to meet many more folks that were out enjoying the weather. 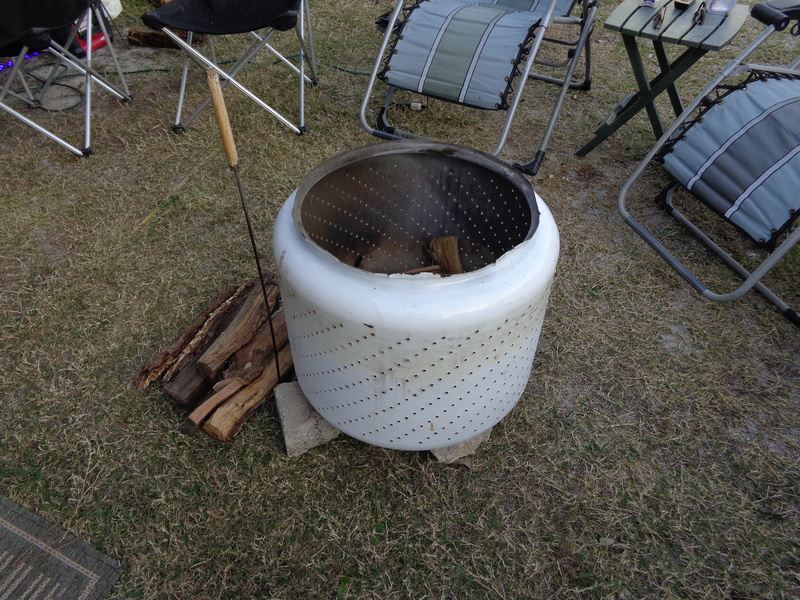 The campsites here do not have fire rings, but you are allowed to bring your own. Our gracious hosts for the Packers/49ers game had an interesting fire ring. When they sold their house last year, they decided not to include their old washing machine, and instead took out the tub and brought it with them in their RV. It makes an excellent fire pit. 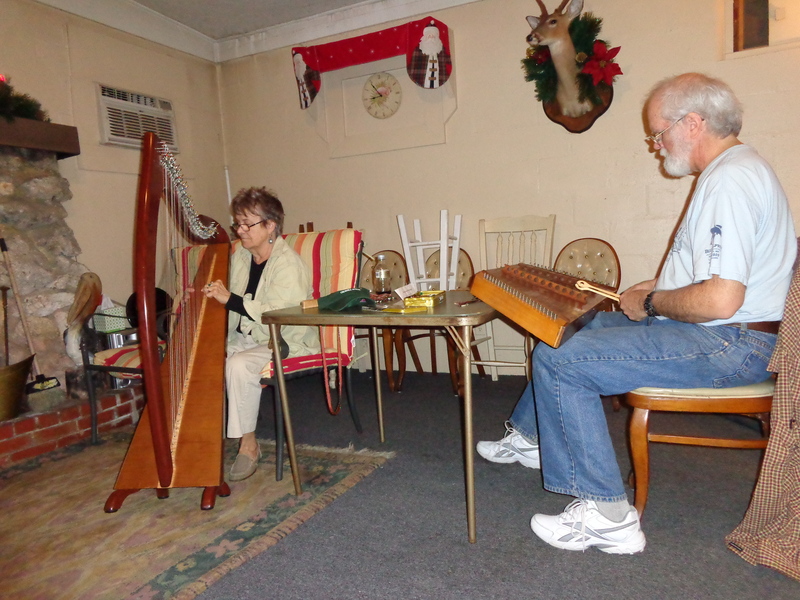 After the game, another couple entertained us with their wonderful musical talents, playing a harp (yes, they travel with a harp!) and a Hammer Dulcimer. I have never seen such an instrument, but they played many beautiful songs. By Tuesday, the weather turned cold, and one of our fellow campers decided we should have a chili cook-off. We had many different styles of chili, from your traditional meat and beans, to vegan and gluten-free recipes, and one with buffalo meat. I decided to try something new, and went to my favorite source for recipes, Taste of Home, (http://www.tasteofhome.com/) and found a white chicken chili recipe for the crock pot. It was very easy to make and very flavorful. All the chilis were very good. 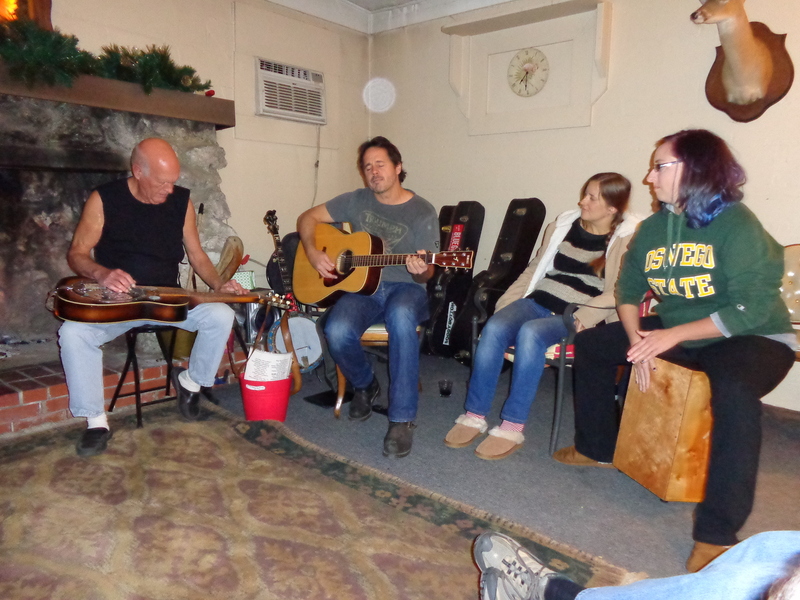 And as happens so often, another impromptu musical session broke out after we all stuffed ourselves. One of the couples has a 4-year-old daughter that kept telling everyone, “everyday is a great day”, and to “be happy and kind to others”. Good advice!